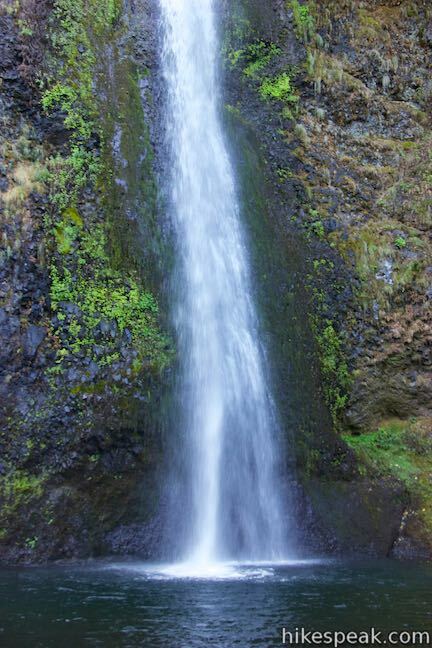 Do you have a need for waterfalls? 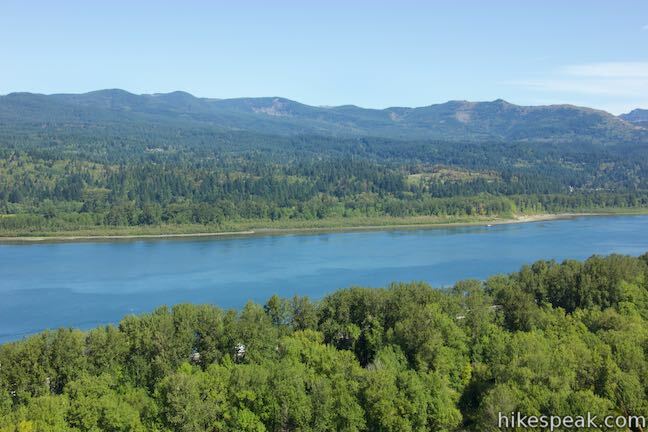 Heading to the Columbia River Gorge is a good start (the area is stocked full of them). 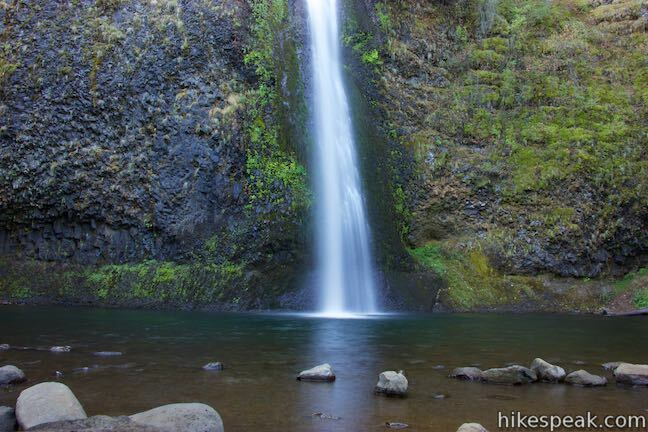 If you choose to hike Horsetail Falls Trail, you’ll get a tall waterfall right at the trailhead. 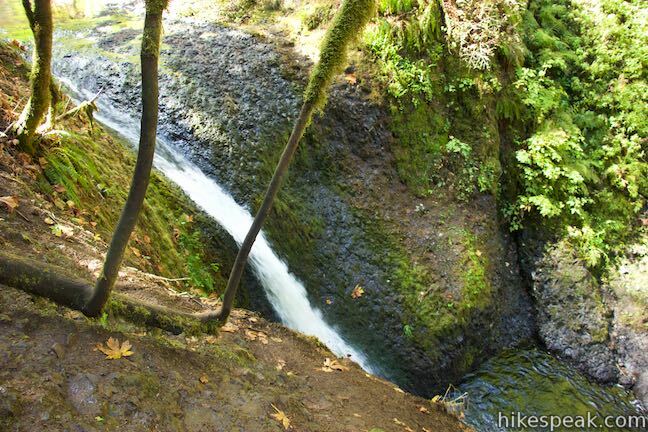 Half a mile up the trail, you’ll find another waterfall that you can actually walk behind. 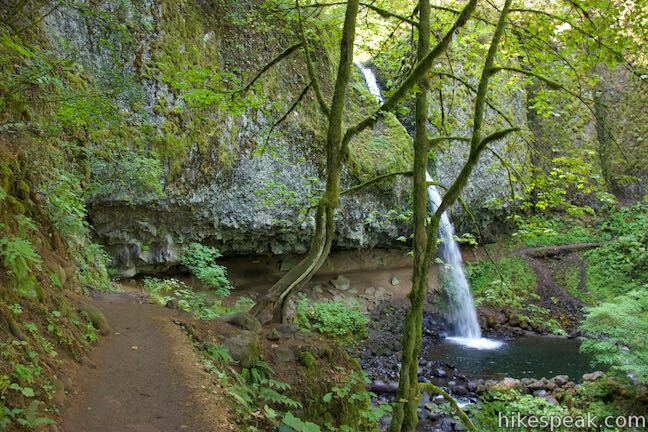 Combine Horsetail Falls Trail and Oneonta Trail for a 2.85-mile loop that includes Horsetail Falls, Ponytail Fall (also known as Upper Horsetail Falls), Middle Oneonta Falls, and two viewpoints looking out over Columbia River Gorge. 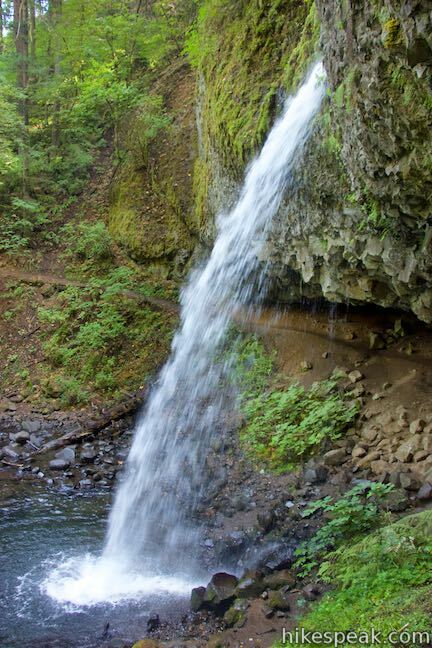 If you need more falling water, you can extend the loop to include additional waterfalls like Lower Oneonta Falls. 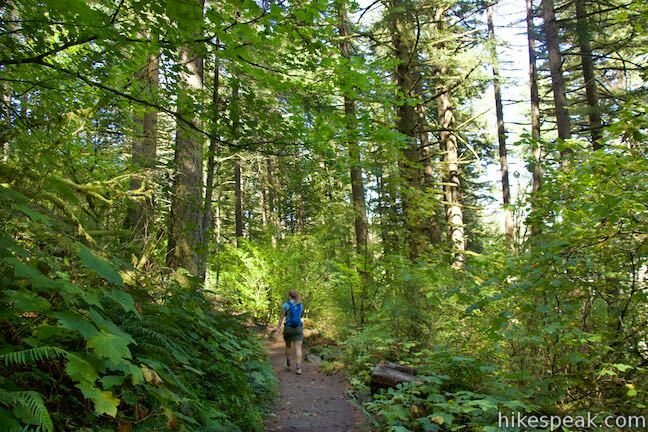 The loop has 325 feet of elevation change. 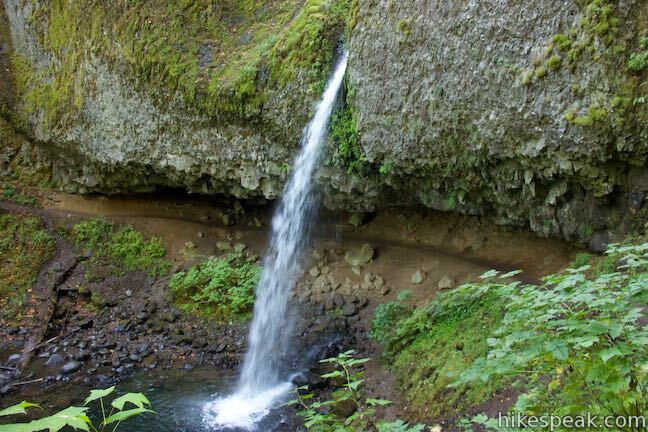 With less effort, you can turn around at a viewpoint above Ponytail Falls and trim a mile off the length of the loop. 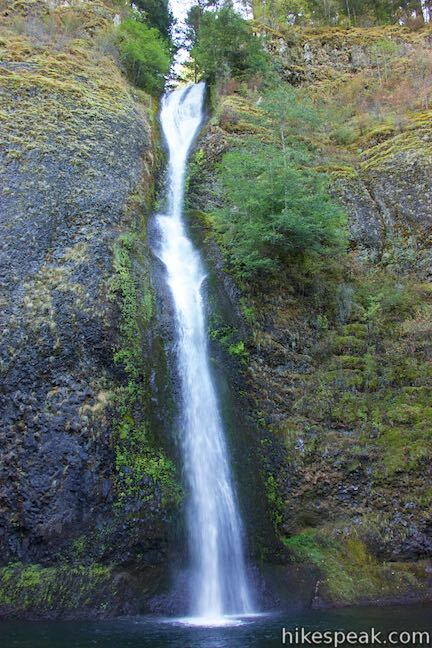 Get out of your car and walk up to Horsetail Falls, a column of white water sliding 176 feet down cliffs of volcanic rock into a pool next to Historic Columbia River Highway. 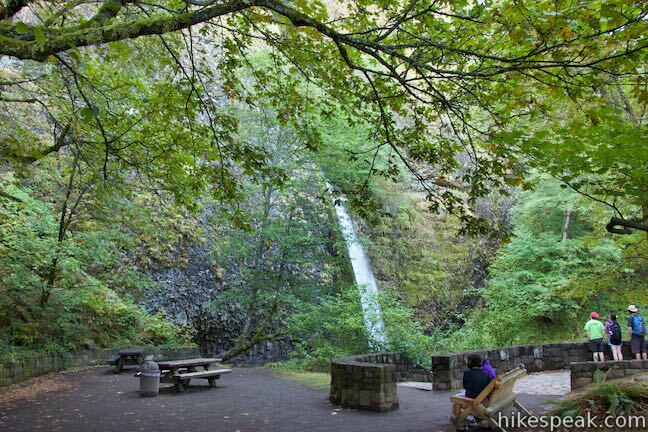 Admire the falls from a viewing area with picnic tables or step down to boulders at the edge of the broad pool beneath the falls. 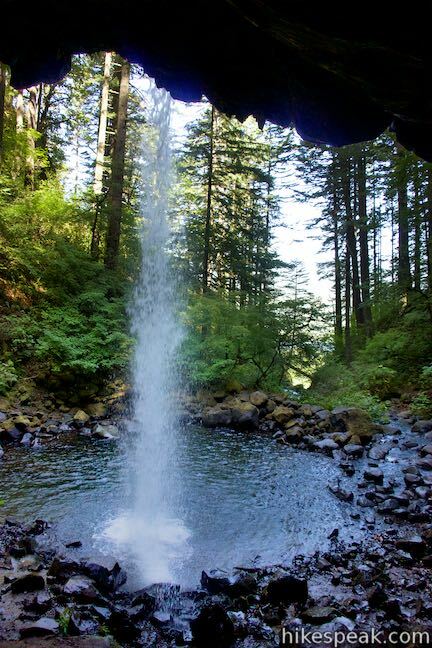 Look up at the cataract, 176 feet above, where Horsetail Falls appears between moss-covered cliffs. A couple small twists toward the top tweak the trajectory of the near vertical plunge. 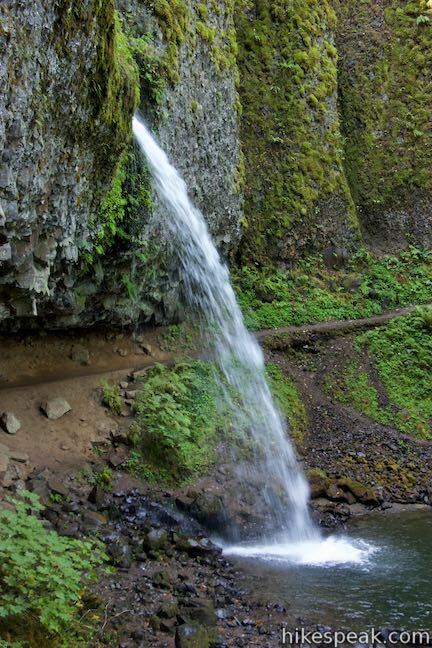 Does the waterfalls look like a horse’s tail? That’s a stable comparison. 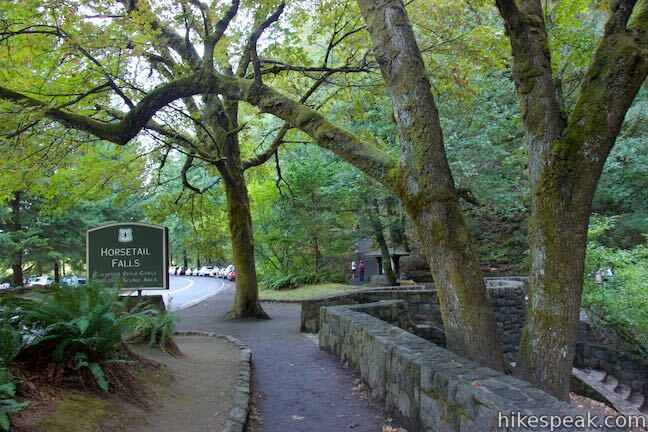 Horsetail Falls Trail begins from the viewing area on the east side of the falls alongside an information panel and a couple trail signs. 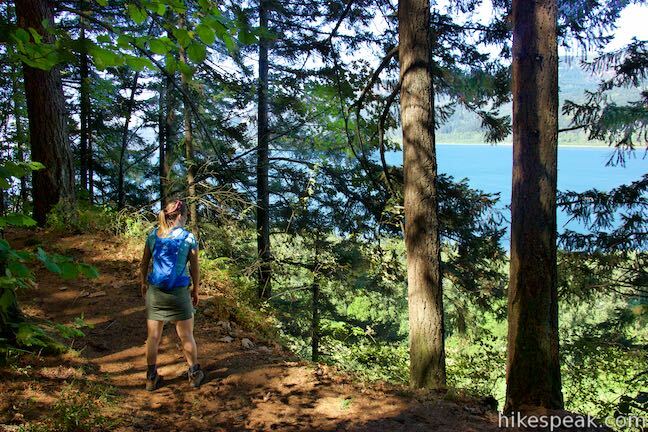 Hike up the dirt trail, which uses switchbacks to ascend the side of Columbia River Gorge. 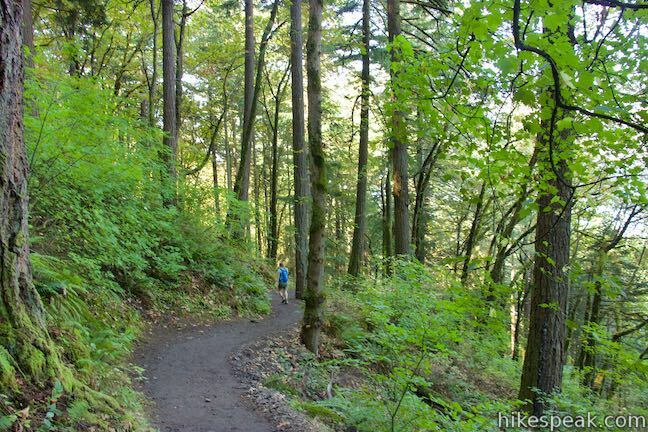 Make your way up the lush slope through a temperate rainforest that has a mix of coniferous and deciduous trees. 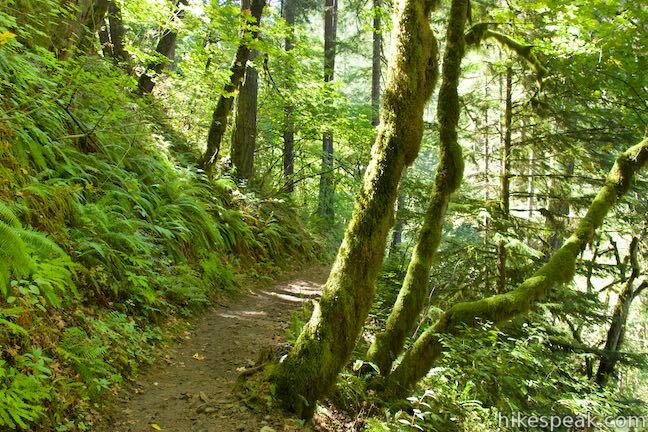 Ferns and brush cover the ground while moss and lichens cling to boulders and tree trunks, adding lots of yellow-green to the surroundings. 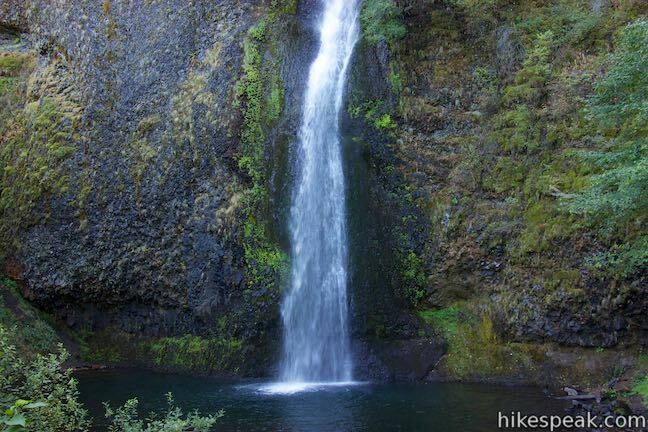 At 0.2 miles from the start of Horsetail Falls Trail, bear right at a junction with Gorge Trail, which goes east. 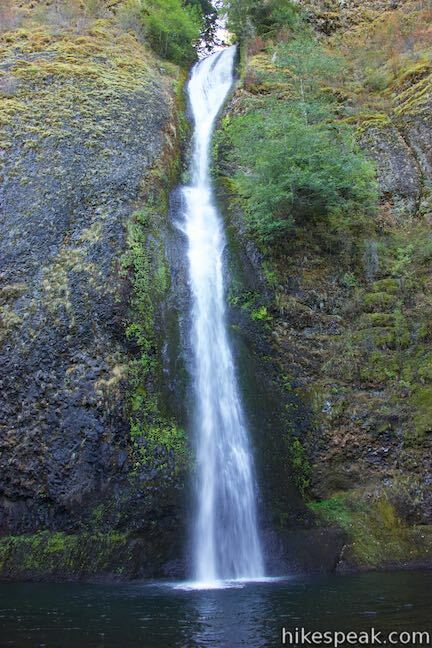 Continue up Horsetail Falls Trail, rising farther up the side of the gorge. 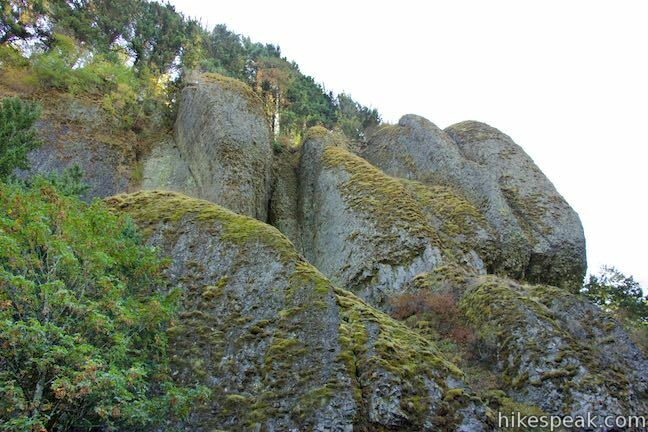 Cliffs of volcanic rock rise high above the trail. 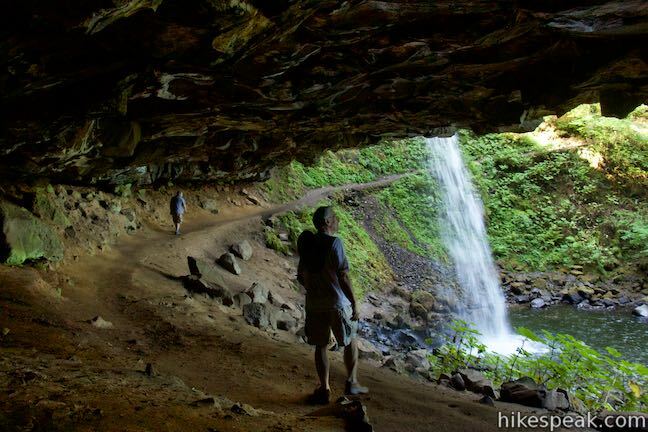 After it rains, you’ll find lines of water dripping down the rocks. 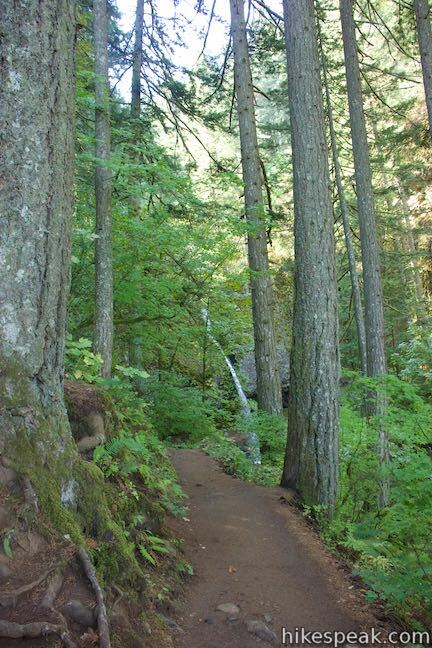 The trail bends to the left and Ponytail Falls appears through the trees. 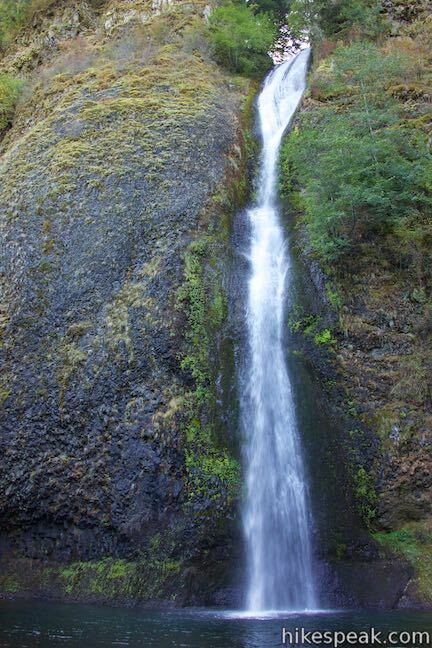 Also called Upper Horsetail Falls, this waterfall is shorter (maybe that’s why it’s just a pony) and measures 75 feet tall. 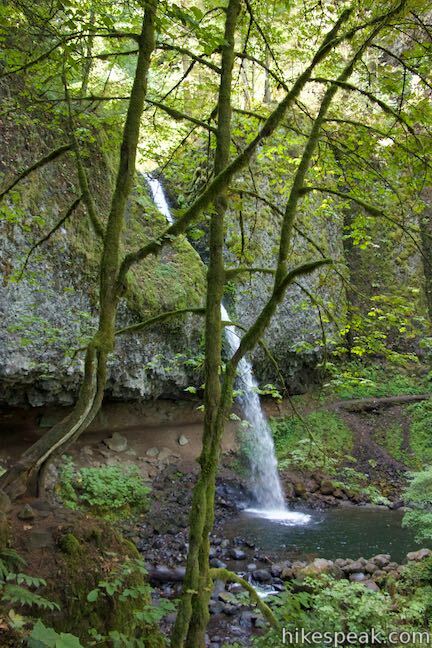 The waterfall springs from a cut through a ledge of gray basalt and leaps away from the cliffs, free falling into a basin below. 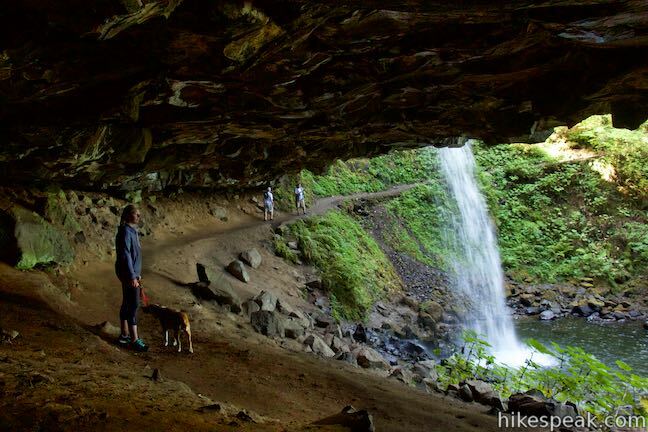 Underneath the ledge of volcanic rock, the earth has been undercut behind the falls, leaving a large overhang that is big enough for you to hike through. 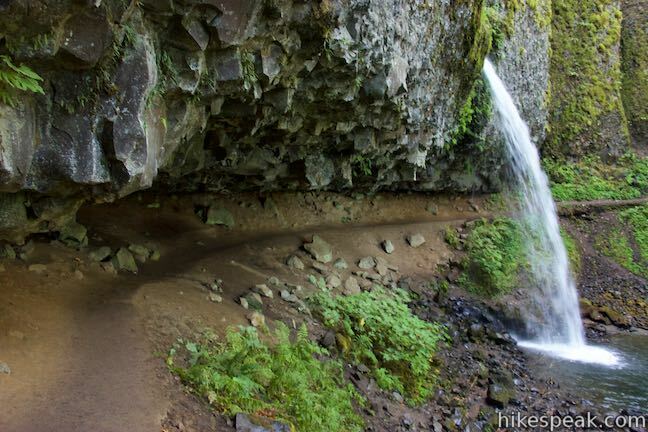 The trail uses the overhang to wrap around behind the waterfall, putting a horseshoe-shaped bend in the trail around Ponytail Falls. Beneath the cliffs, you can look back out and watch water appear overhead as if from nowhere and shower past the opening. 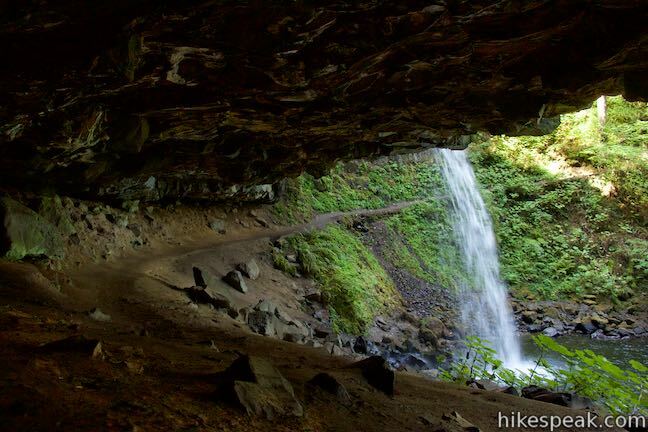 The trail continues out the other side of the overhang and curls up the east side of the falls. 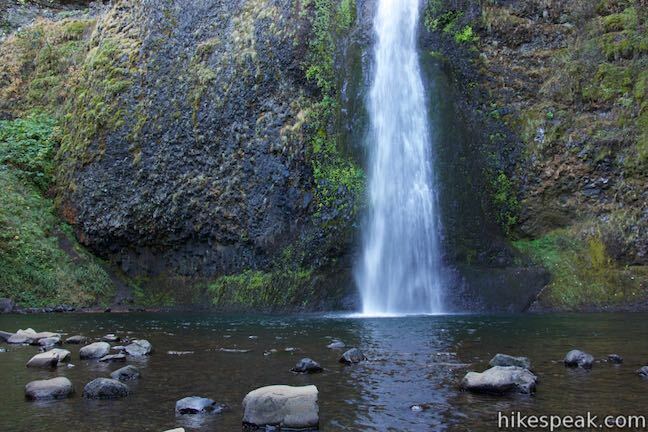 With views of Ponytail Falls from almost every angle, Horsetail Falls Trail really gives you intimate exposure to Ponytail Falls. 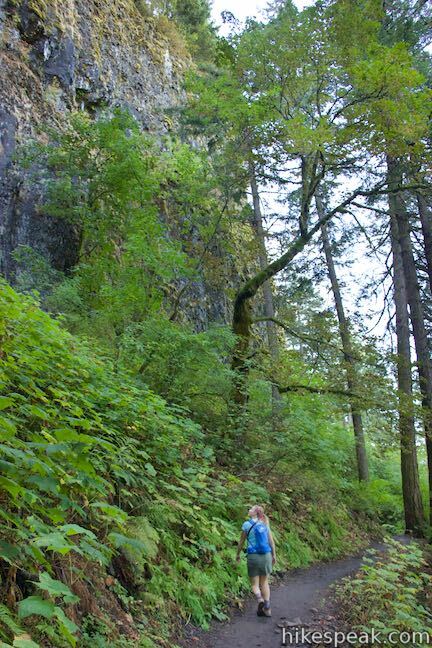 The trail keeps going west along the side of the gorge. 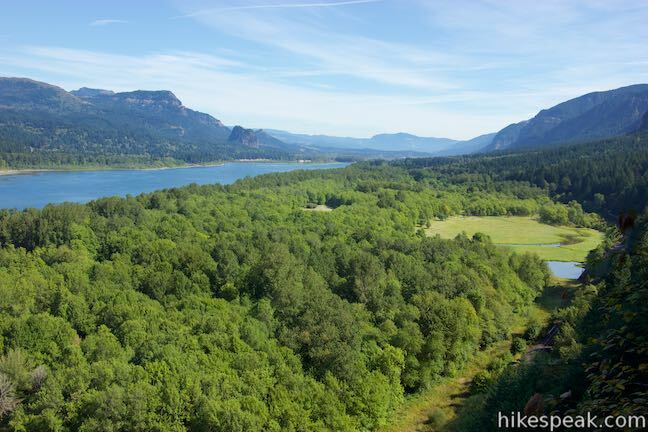 Not far from Ponytail Falls and 0.9 miles from the start of the hike, a path breaks off to the right and goes out to the edge of a bluff for massive views north and east across Columbia River Gorge. 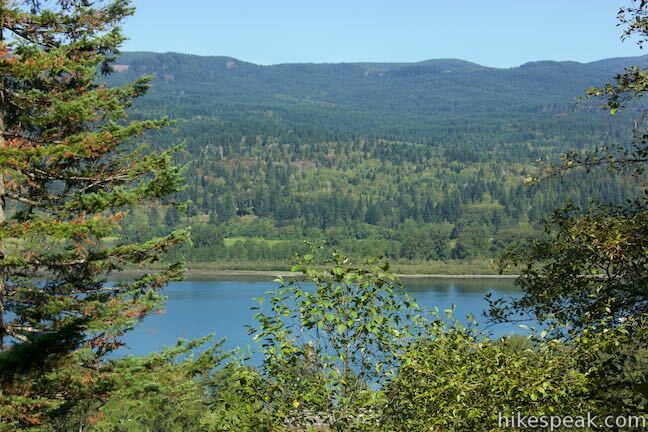 Beyond the wide river is the state of Washington. 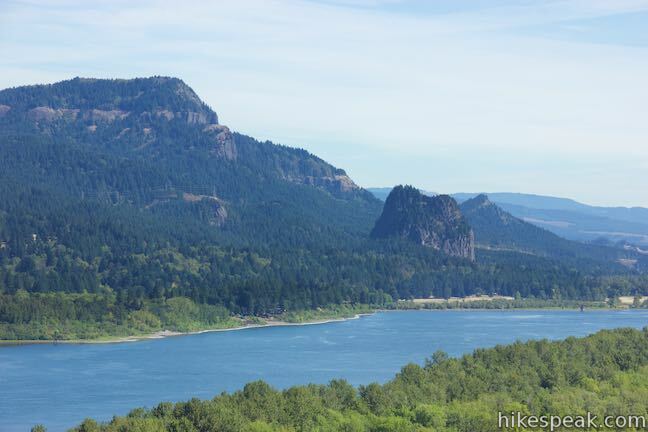 Cliffs lie straight across the river and interesting ridges rise to the northeast, including the standout Beacon Rock. 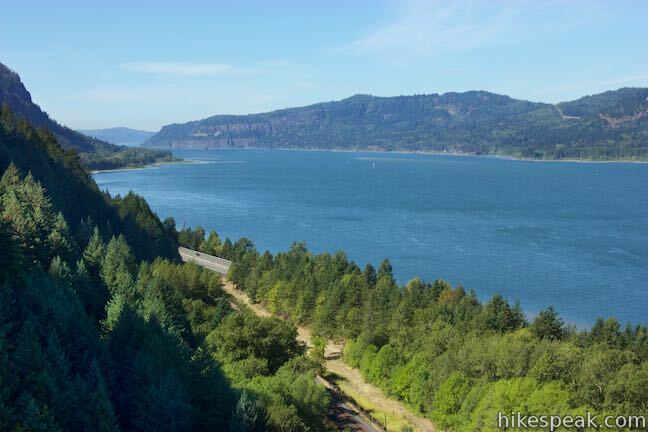 You can also peek over the edge of the cliffs below the overlook and look down on a flat area along Columbia River where channels of water have somehow formed in the shape of an “X.” This would not be a bad place to turn around early, resulting in a 1.85-mile hike. 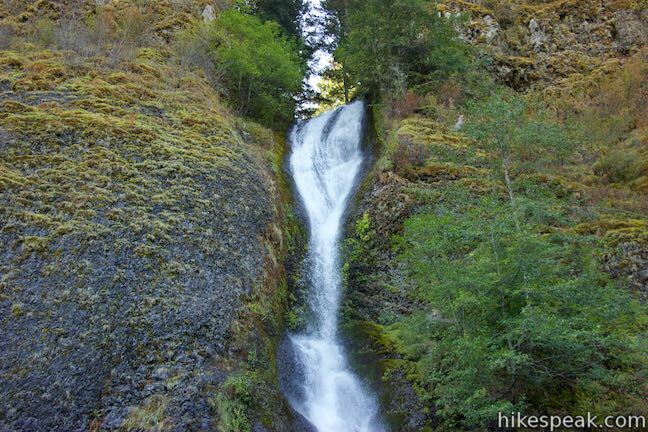 Otherwise, continue on Horsetail Falls Trail. 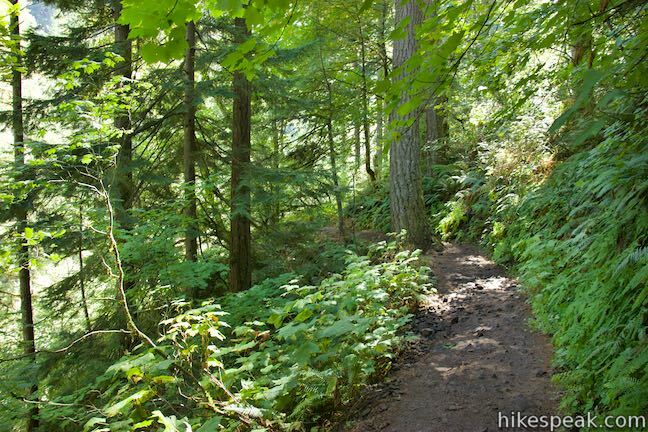 The trail proceeds uphill for a stretch through plenty of vegetation. 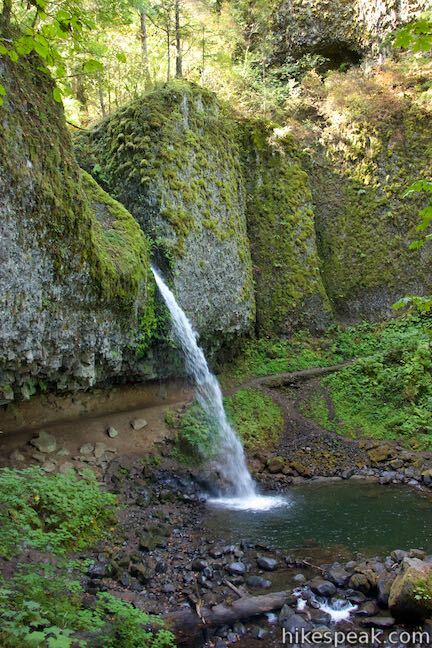 Pass a spot where water seeps down the cliffs on the left, dripping off moss and ferns to form a stream. 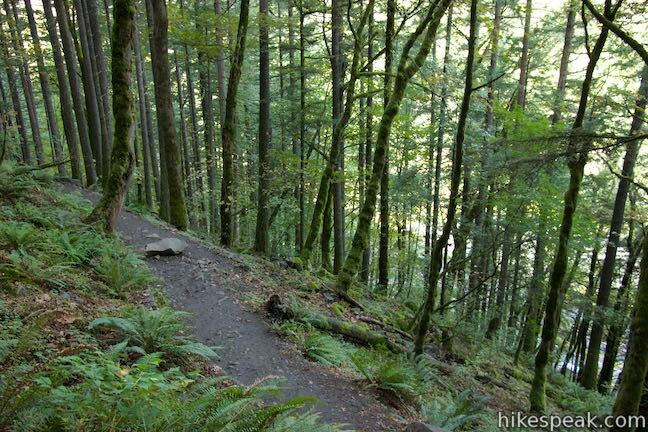 The trail turns downhill and drops rapidly toward Oneonta Creek. 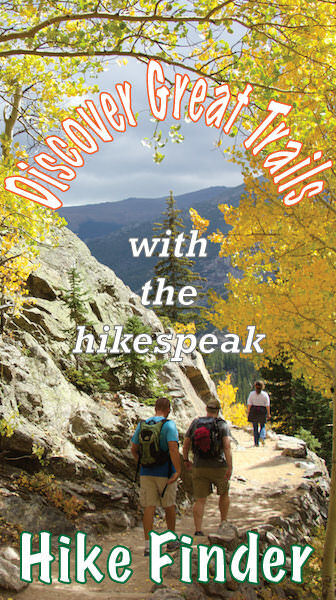 Switchbacks provide a swift descent. 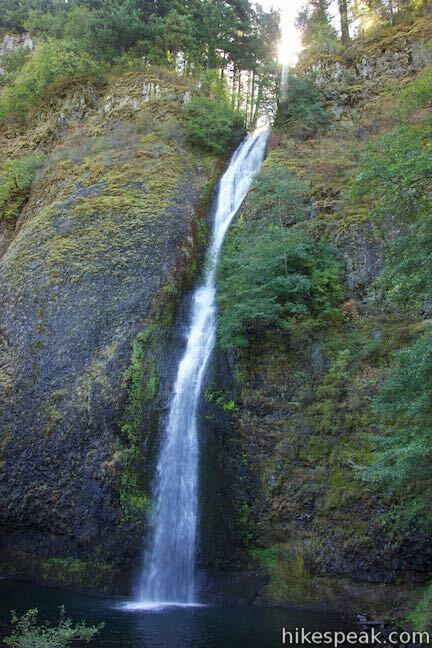 On the right, you may catch views down into Oneonta Gorge or hear people trekking to Lower Oneonta Falls, which is a just-out-of-view beauty in the creek below. 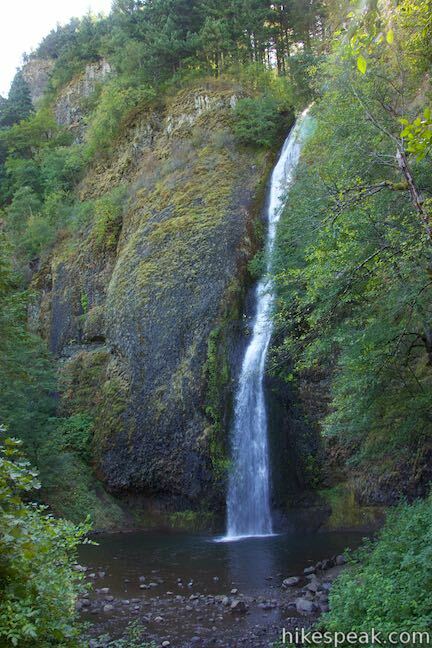 Across the bridge, you’ll get a clearer view of Middle Oneonta Falls. 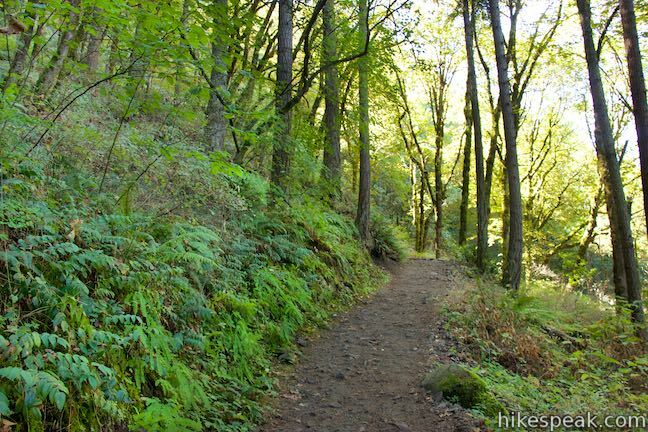 The single track then goes uphill, rising to a T-junction with Oneonta Trail. 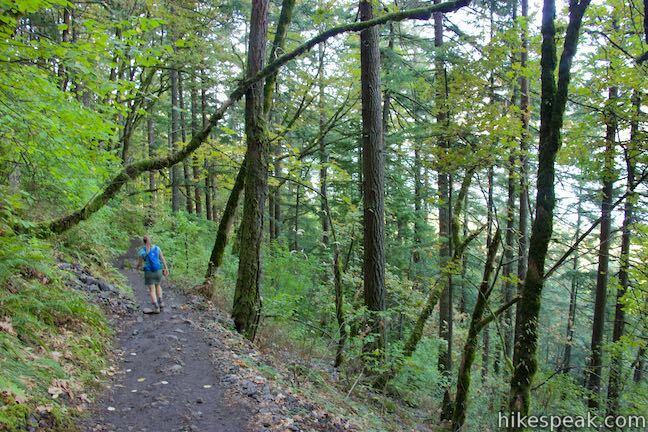 To the left, Oneonta Trail ascends along Oneonta Creek toward Larch Mountain. 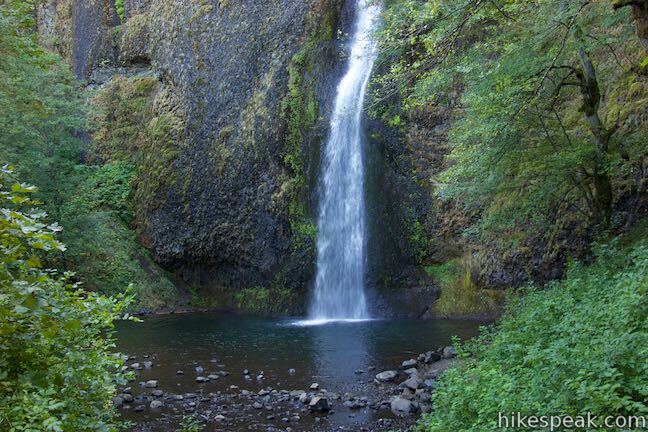 After about a mile, the trail passes Triple Falls, a segmented waterfall with three roughly parallel ribbons of water. 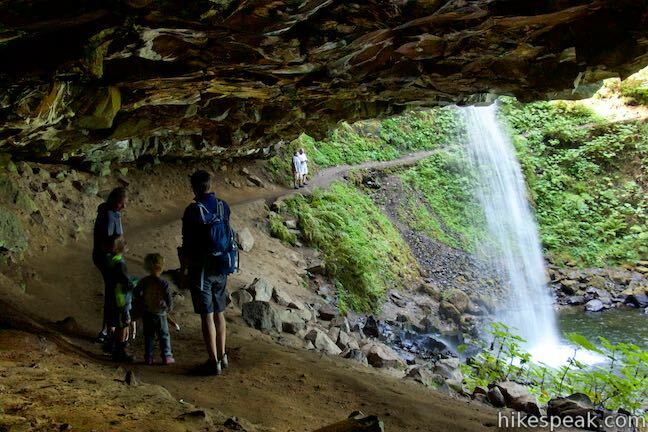 Visiting the waterfall is a popular extension off this hike. 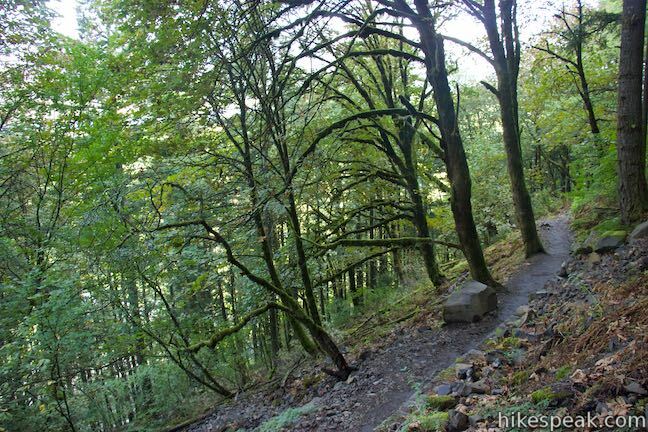 Turn right down Oneonta Trail to continue the loop, reaching a viewpoint before descending to Historic Columbia River Highway. 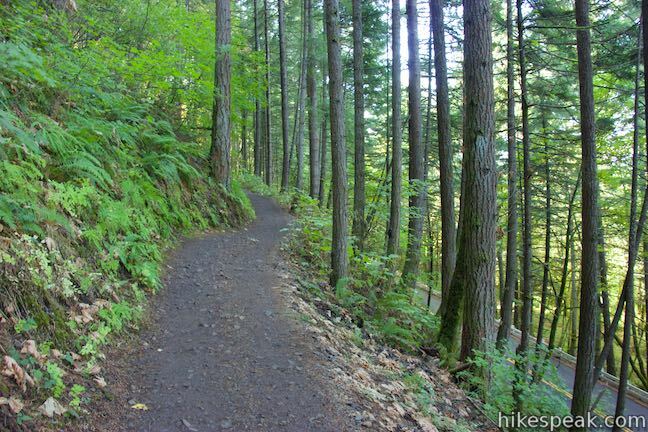 The trail turns south and ascends gradually for a short stretch. Be on the look out for a path breaking off to the right, 0.15 miles from the junction. 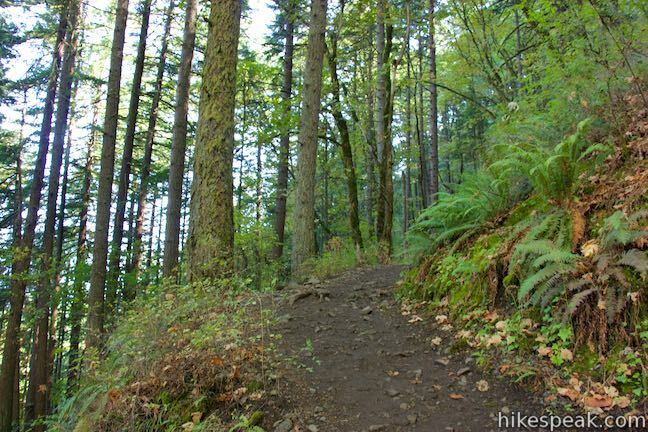 A wooden sign on a tree next to the path reads, “viewpoint.” To grab this view, bear right on the path, which reconnects with Oneonta Trail after 0.2 miles. 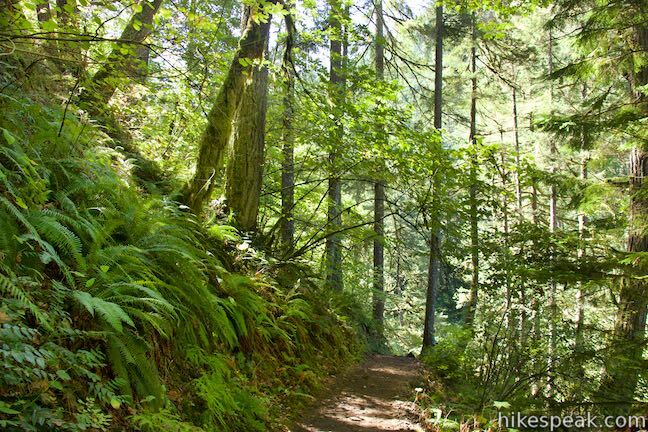 The path goes out to the forest on the edge of the bluff. 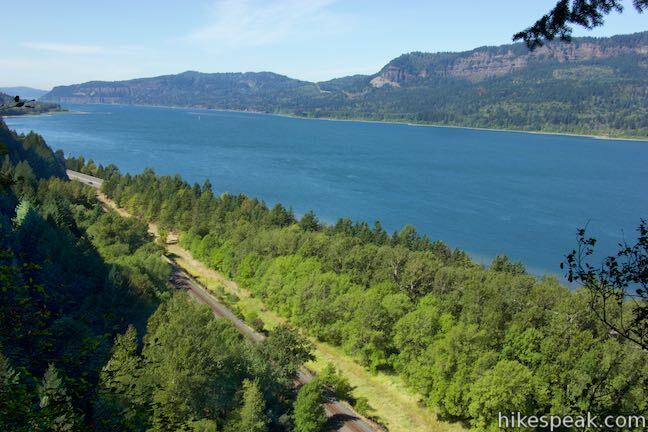 Beyond the last line of trees, the cliffs drop a couple hundred feet down into Columbia River Gorge. 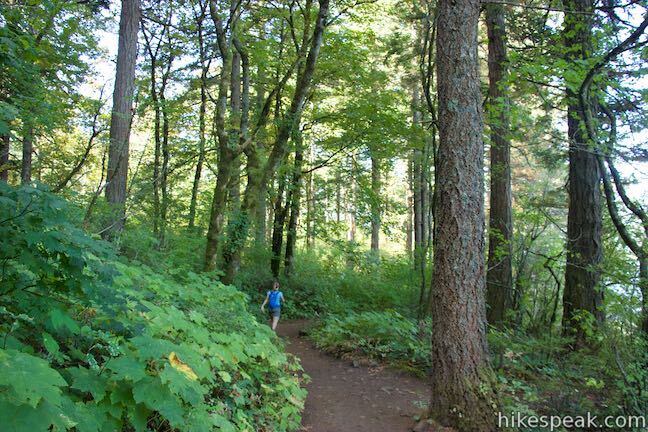 At first it is tough to find views through the trees. 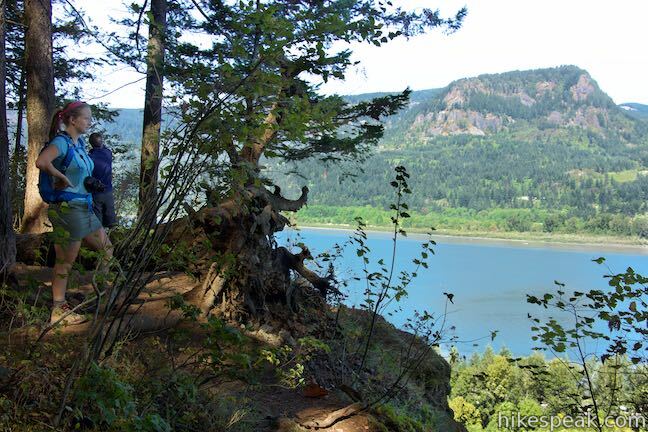 The trail curves to the left and finally finds some nice gaps between branches for views west down the Columbia River. 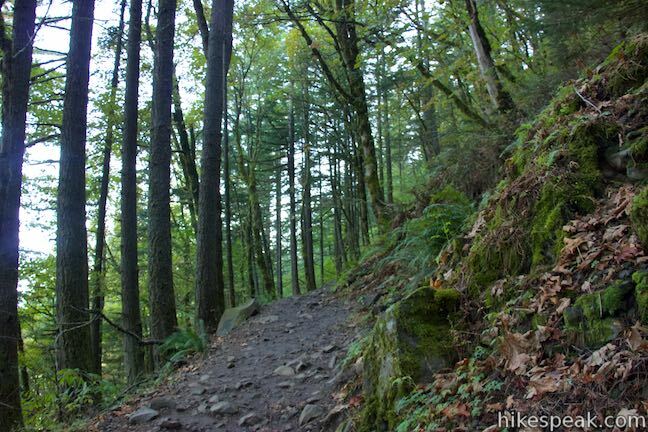 Follow the path as it curves to the left again and ascends a rocky slope back to Oneonta Trail. Turn right to get back on course. 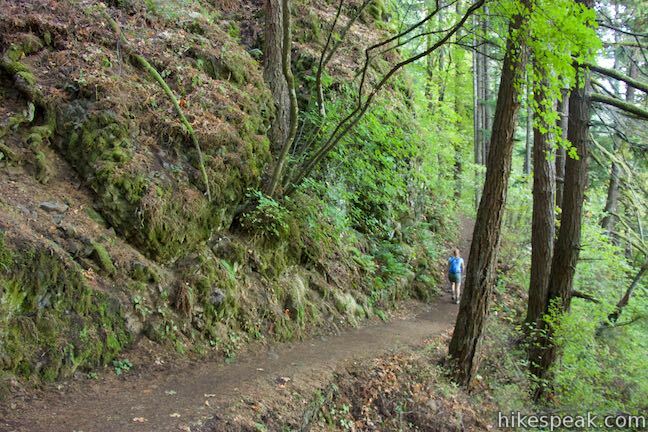 Oneonta Trail makes its way down the side of the gorge, passing below steep volcanic cliffs. 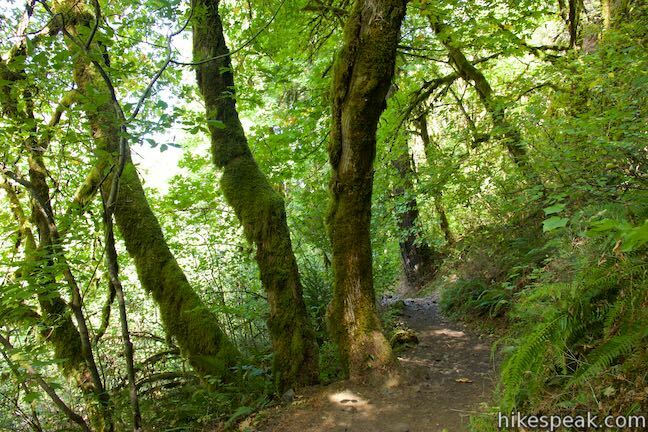 Maples, ferns and other greenery are abundant along the trail. 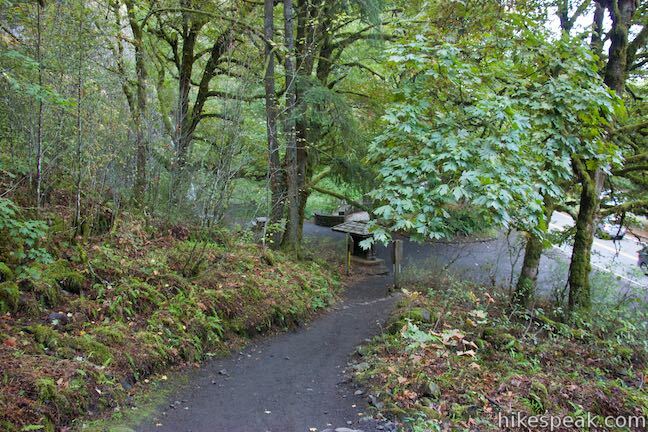 Oneonta Trail comes down to a junction with Gorge Trail at a switchback. 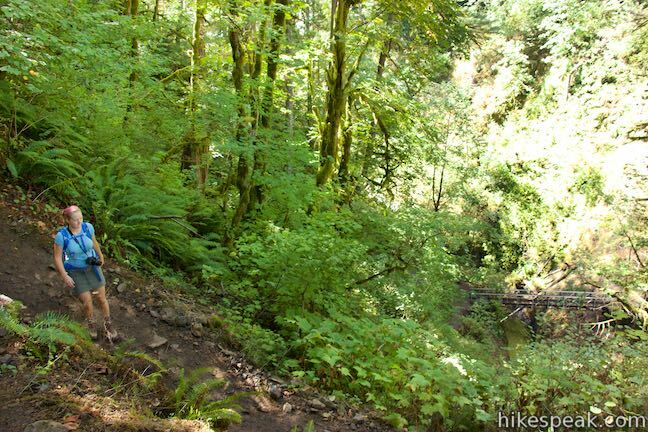 Gorge Trail goes west toward Multnomah Falls. Bear right around the bend to proceed down Oneonta Trail. 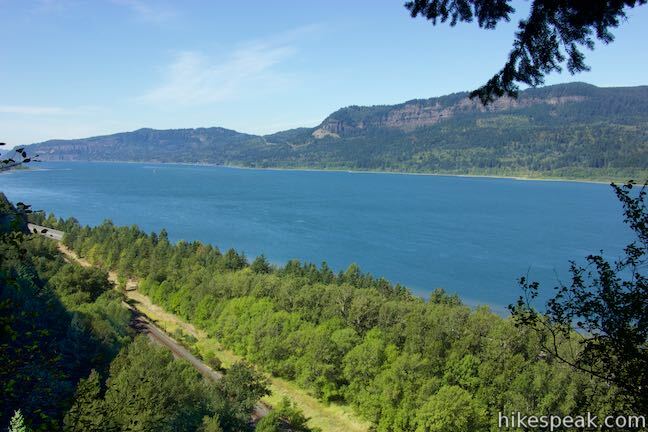 The trail heads east now, making its way down to Historic Columbia River Highway. 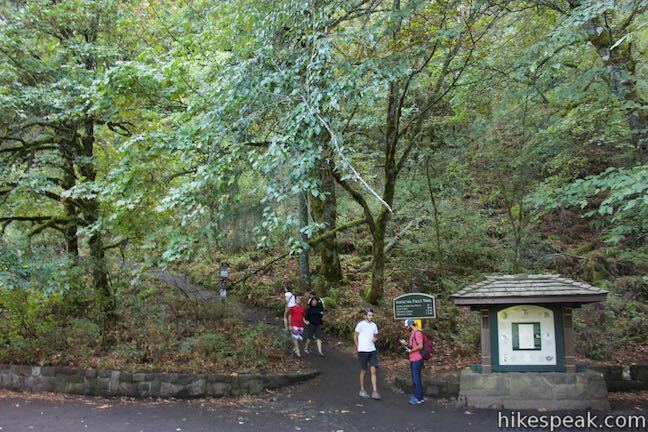 Reach the bottom of Oneonta Trail, 0.2 miles from the previous junction and 2.3 miles from the start of the hike. Bear right along the highway to hike the last 0.55 miles back to Horsetail Falls, which are level and easy. 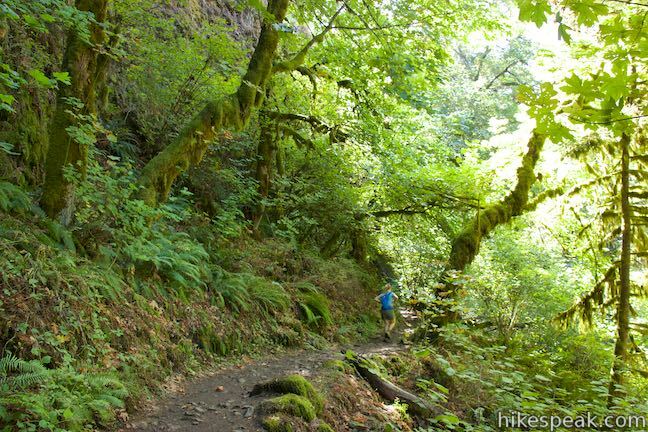 Walk east along a gravel path bordering Historic Columbia River Highway and come to a parking area west of Oneonta Gorge. 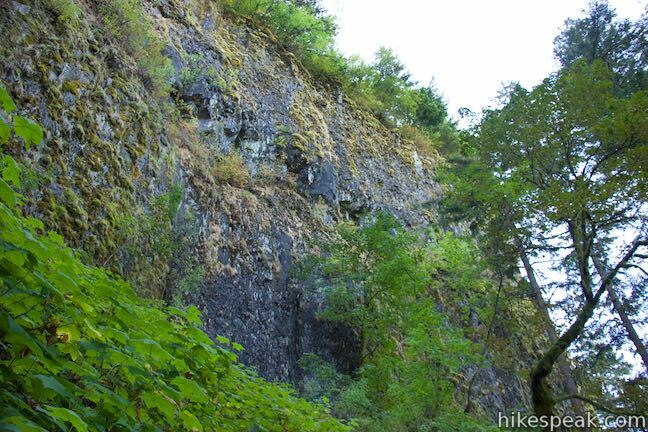 Look up at the steep cliffs overhead. 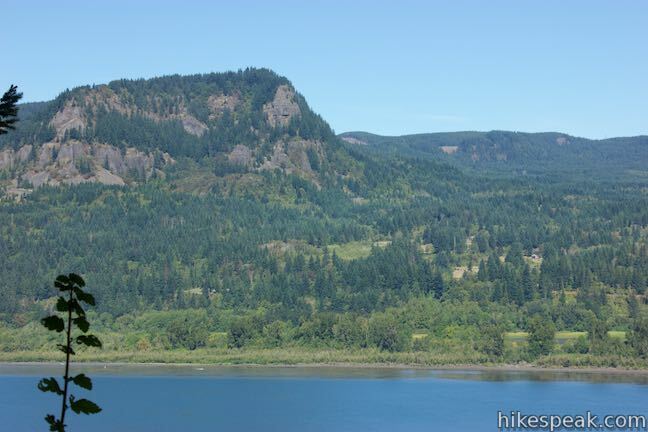 Lot long ago, you were standing on top of these cliffs at the viewpoint off Oneonta Trail. 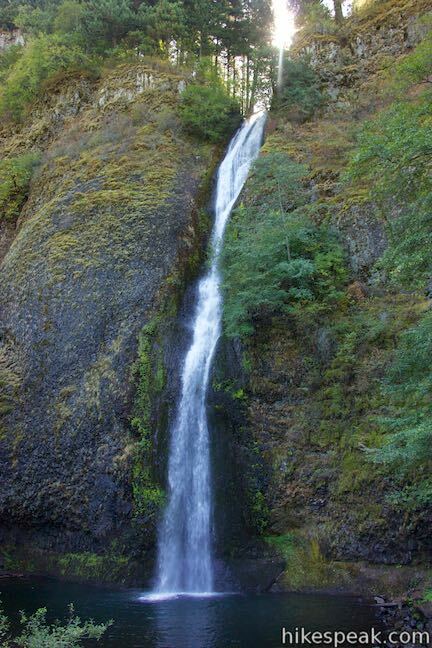 Pass the mouth of Oneonta Gorge where you could add on another extension to the waterfall upstream. 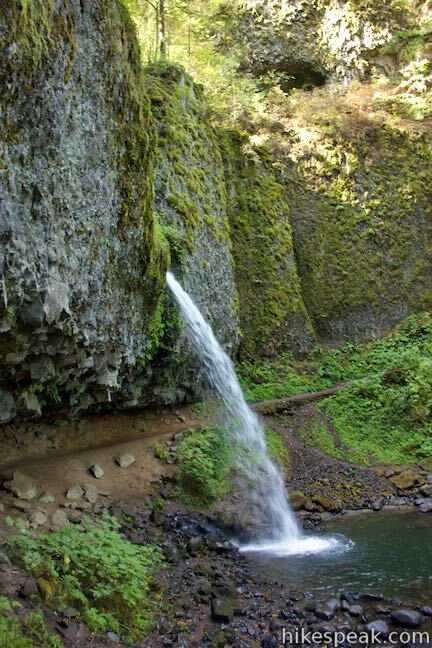 No trail goes up the narrow gorge so reaching beautiful Lower Oneonta Falls requires a fun adventure of climbing over boulders and tree trunks and wading through Oneonta Creek. 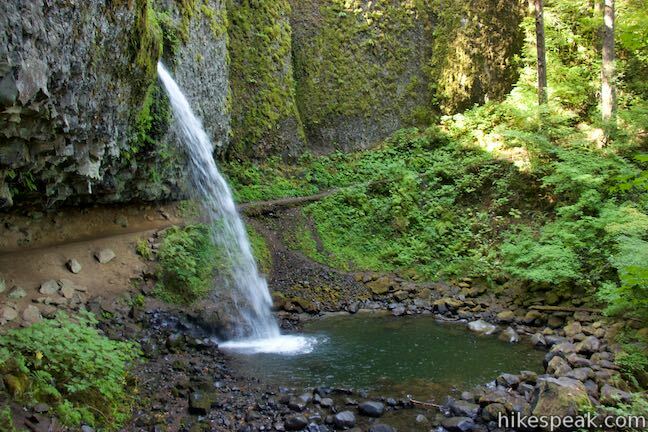 It’s a good hike to do on a warm late summer day in clothes and shoes that you are prepared to get wet. 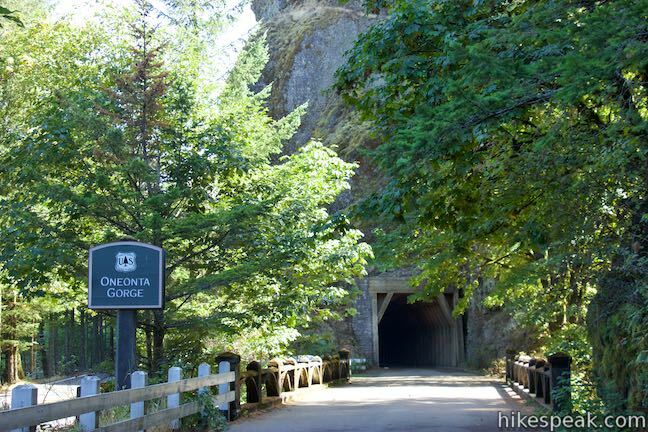 Continue over the bridge across Oneonta Creek and head through a tunnel carved into the cliffs east of the gorge. 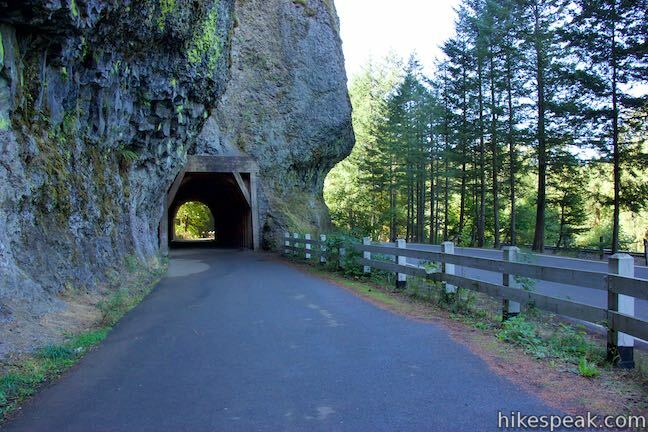 Out of the tunnel, you’ll walk along the road and cross Horsetail Creek. 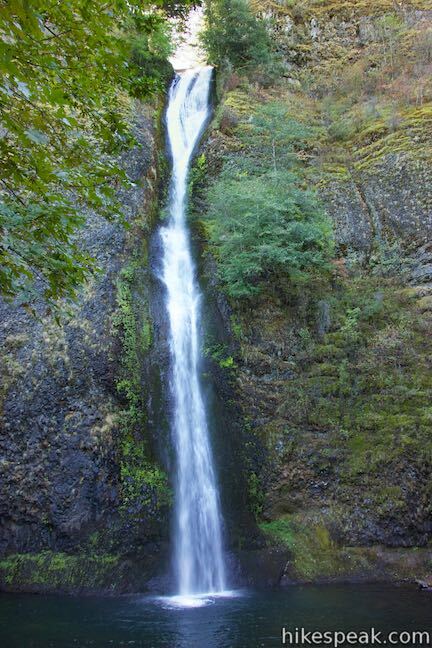 Enjoy a second round of Horsetail Falls views as you close out the loop. 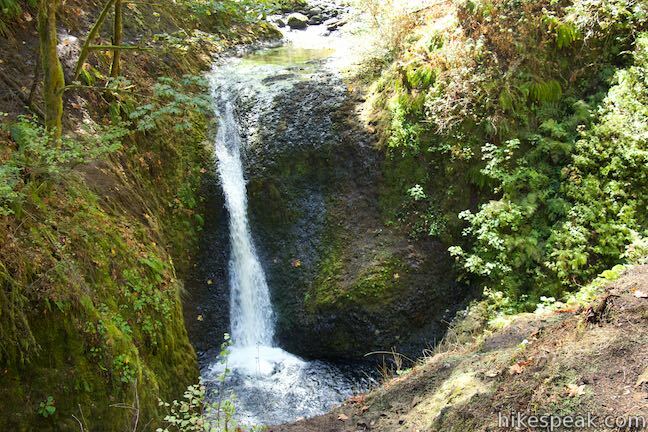 It would be cheating to count this as the fourth waterfall on the loop since it’s a repeat. 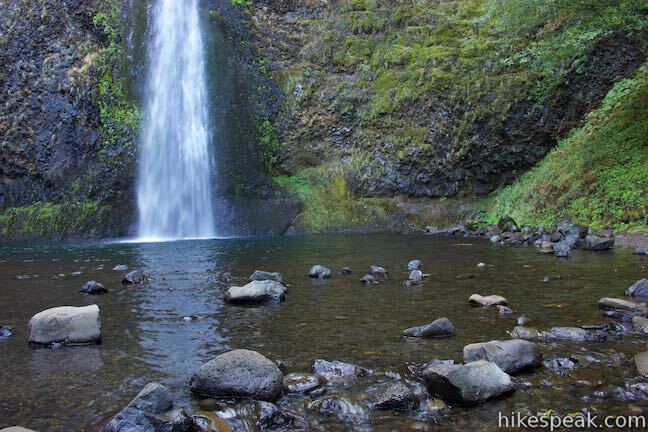 However, this reinforces that the hike is packed with waterfalls and sure to be a hit with waterfall lovers. Dogs are permitted on these trails but bikes are not. 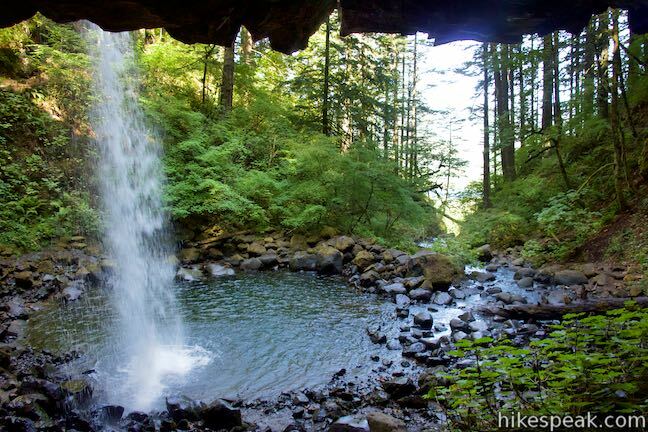 No fee or permit is required to hike Horsetail Falls Trail – Oneonta Trail Loop, so get out and enjoy. 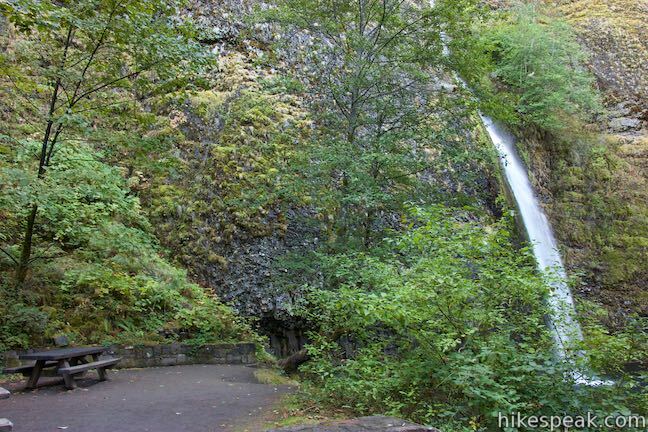 CLOSURE UPDATE: Horsetail Falls Trail to Ponytail Falls has reopened to the public following damage from the 2017 Eagle Creek Fire. The rest of the loop remains closed. 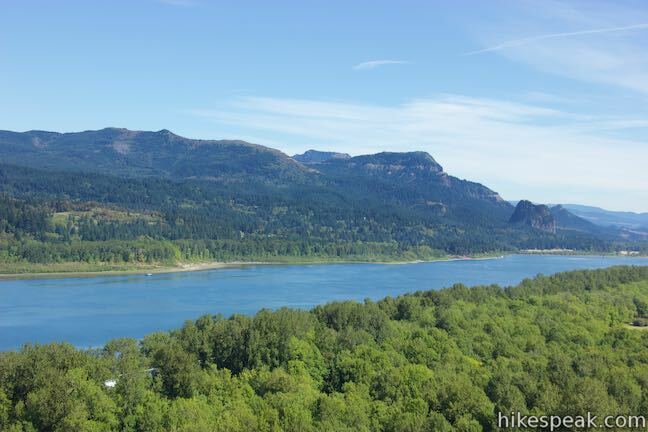 Find more information about the wildfire closure on the US Forest Service’s Columbia River Gorge National Scenic Area: Alerts and Notices webpage. 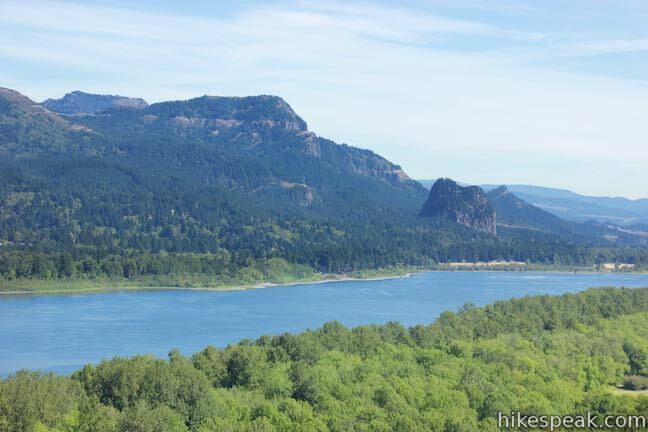 To get to the trailhead: From Portland, take Interstate 84 east for 33 miles to exit 35, following a sign for Ainsworth State Park and Historic Highway. Bear right at the end of the offramp, heading west on a frontage road that immediately meets Historic Columbia River Highway. 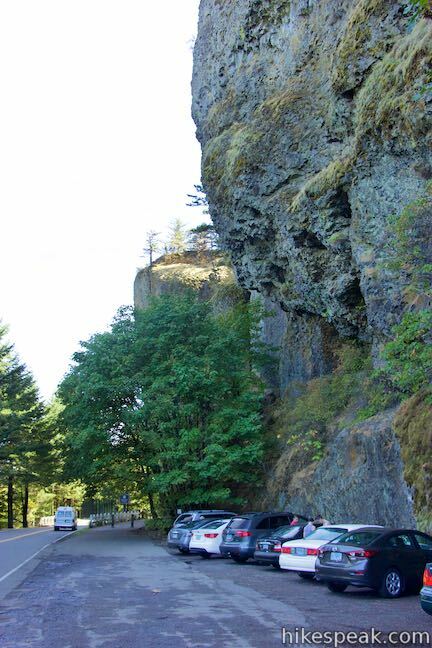 Turn left and drive 1.2 miles to a parking area at Horsetail Falls. 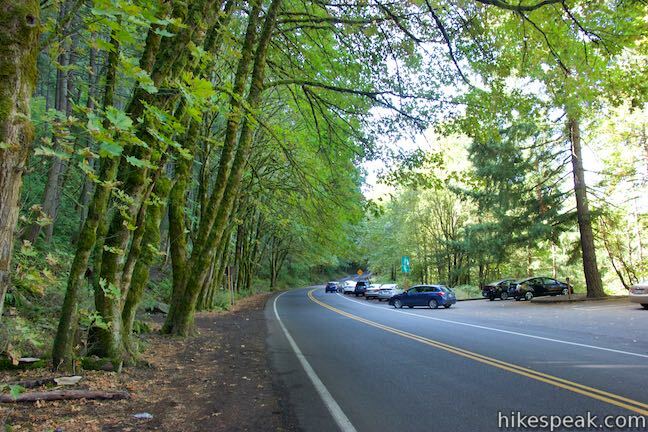 Parking is on the right (north) side of the road across from the waterfall and trailhead. 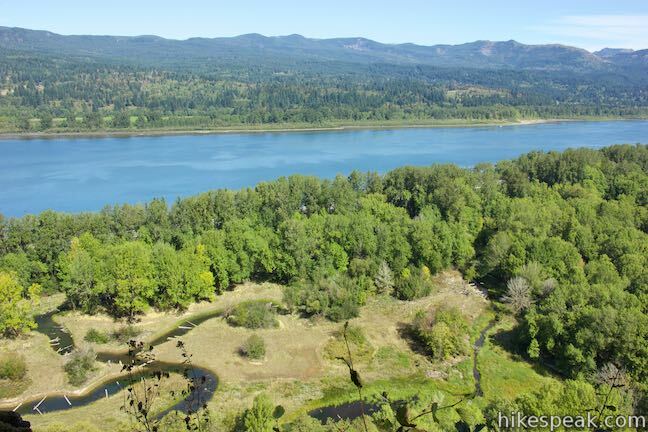 From The Dalles, take Interstate 84 west for 50 miles to exit 35. 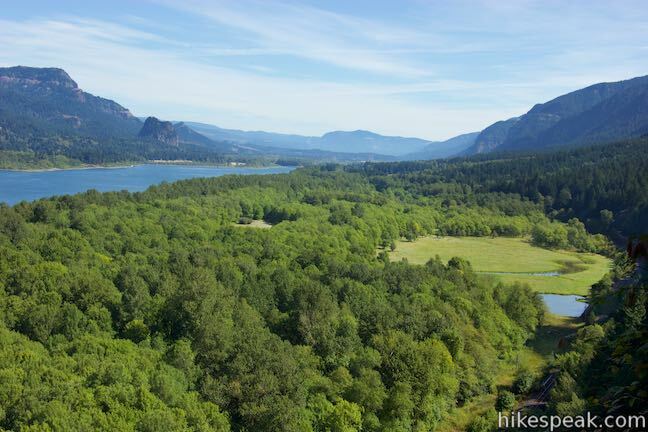 At the end of the offramp, continue west on Historic Columbia River Highway. 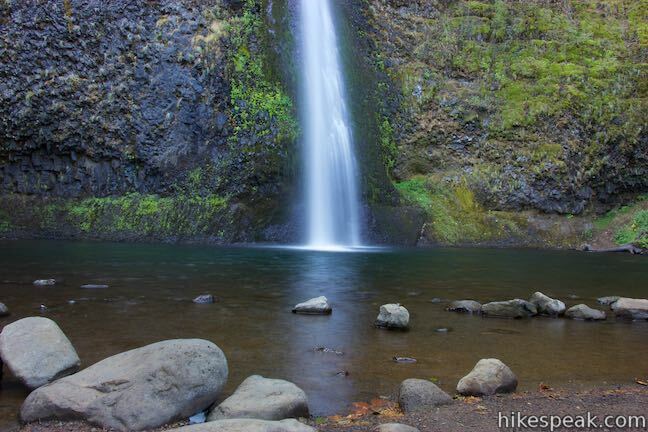 Drive 1.3 miles to the trailhead parking area for Horsetail Falls. These photos were taken in September of 2015. Click to enlarge. 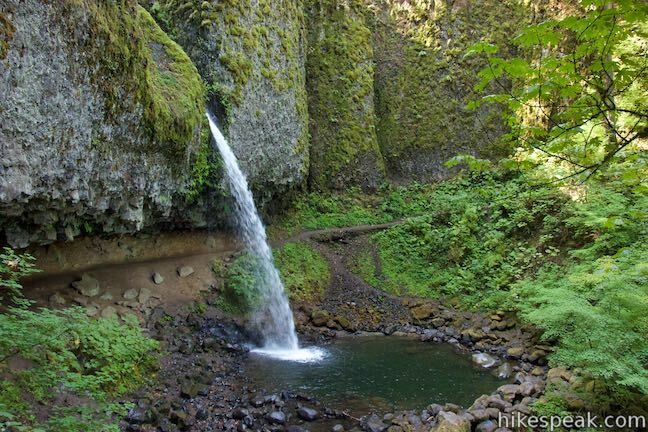 This 0.8-mile trek follows Oneonta Creek between the tall, mossy cliffs of a wild and beautiful gorge to the base of an enchanting 100-foot waterfall. 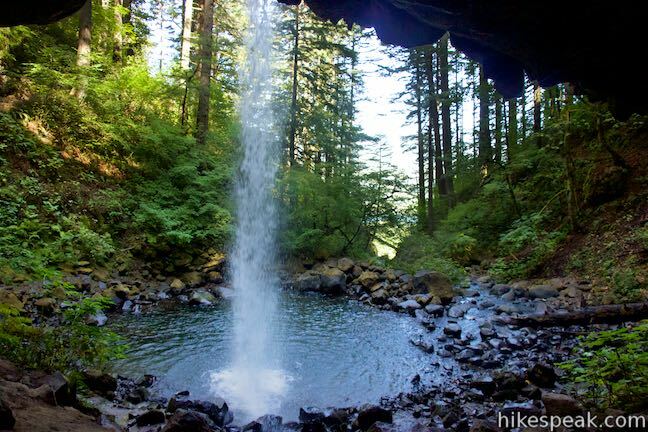 This 6.05-mile loop uses Wahkeena Trail and Larch Mountain Trail to visit six glorious waterfalls (Wahkeena Falls, Fairy Falls, Ecola Falls, Weisendanger Falls, Dutchman Falls, and Multnomah Falls) as well as many fine cascades along Wahkeena Creek and Multnomah Creek in two beautiful canyons off Columbia River Gorge. 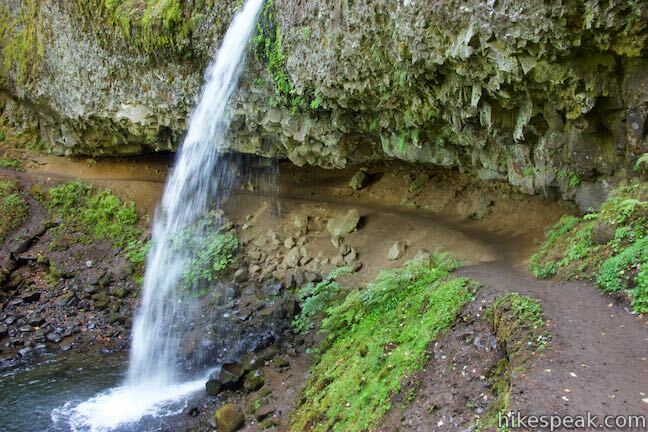 This 2.3-mile loop explores a canyon with two beautiful waterfalls, attaining great views of both. 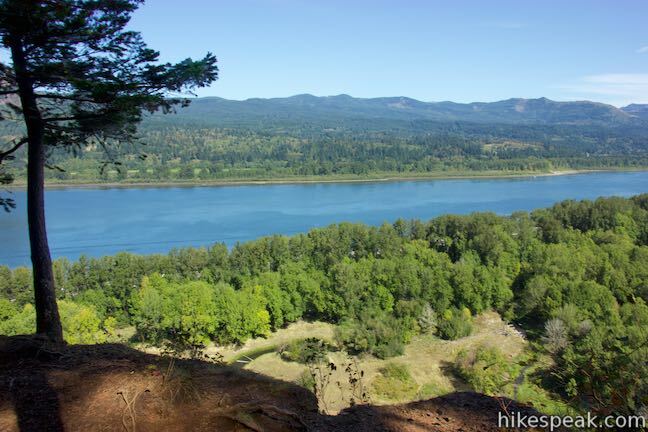 Explore other hikes in Oregon outside the Columbia River Gorge.